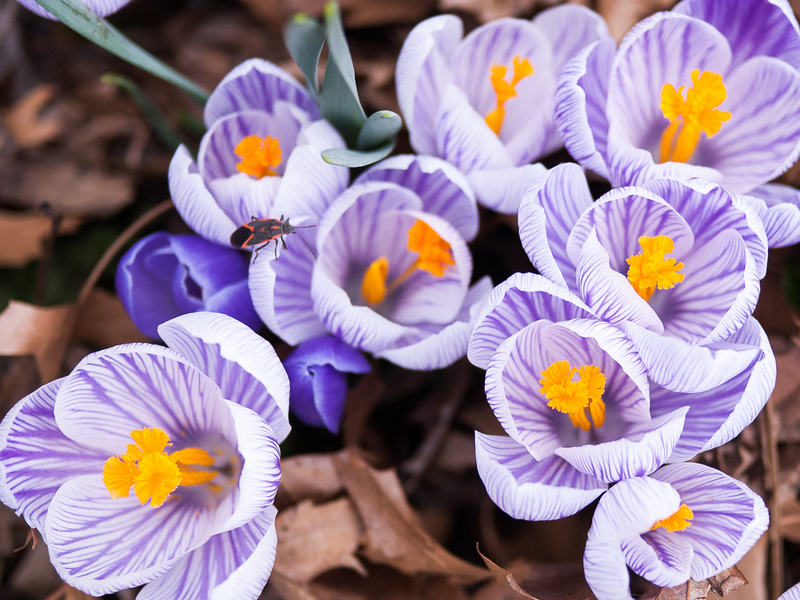 I don’t want to jinx anything, but our spring has been phenomenal so far. A steady string of 70+°F days has woken up our flowers and allowed me to get in lots of grilling time. Considering that the same time last year it was 18°F, with 4-foot drifts, and our driveway slowing shrinking to a car-sized tunnel, I am one happy grillmeister! To celebrate the arrival of ‘sitting outside’ weather, I decided to do up a couple of monster ribeyes. My dear wife also wanted some onions and mushrooms, so I tried a technique I use a lot with chicken and slow-roasted the steaks over the pan of veggies. I set the Big Green Egg up for an indirect cook at 350°F, using a trivet to help diffuse the heat, and just a little bit of pecan for smoke. I trimmed the asparagus and started it marinating in one glug of olive oil, 2 glugs of balsamic vinegar, a squirt of dark mustard, and a dash of kosher salt. I filled a foil pan with mushrooms, onions, a shot of olive oil, and a couple of frozen cubes of beef stock. The pan went on the trivet, the grate went over the pan, and the steaks (seasoned with just a few grinds of black pepper and sea salt) went on top of that. I closed the whole thing up and let all the goodies roast for 20 minutes. I flipped the steak, gave the mushrooms and onions a shake, and put them back on for another 20 minutes more. By now the largest ribeye was at 130°F internal and the mushroom and onions were nicely soft and caramelized. I laid the steaks on top of the veggies and moved the entire pan to a warm oven to rest. 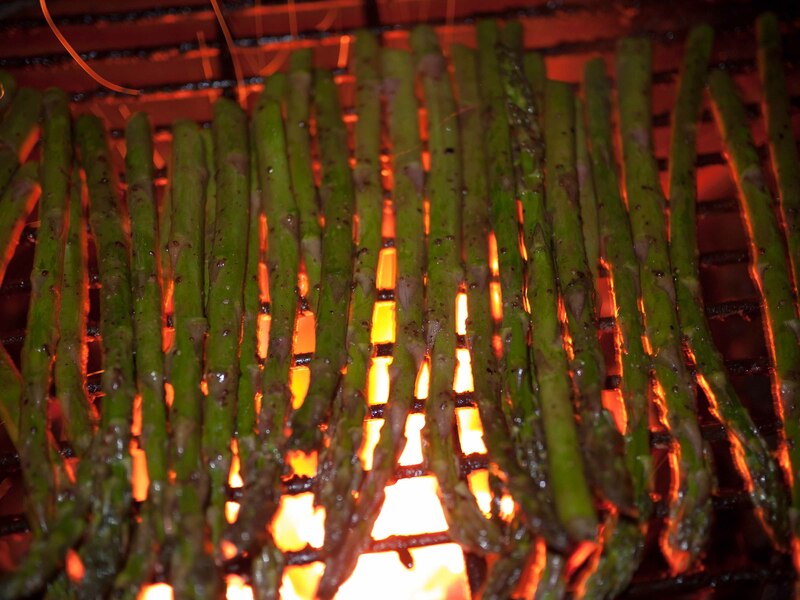 I removed the trivet, and with the lid open grilled the asparagus for about 5 minutes, turning frequently, until the spears started to get tender and pick up a bit of char. While it was warm enough to dine outside, it’s still only late March and we lost the sun just before the steaks were done, so we moved the party indoors. This may very well be my new favorite way to do big steaks. While the steaks didn’t have any sear to them, they were butter knife tender. 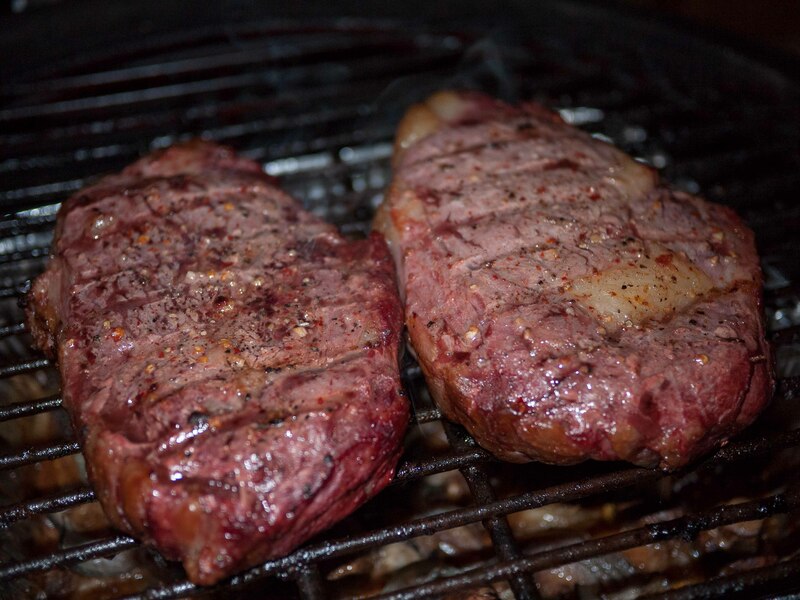 The longer cooking time let the steaks pick up more of the wood smoke than they usually do. I wouldn’t want any more smoke on the meat, but it provided a nice, hot, note on the back of the your tongue. I would probably switch to a little lighter wood next time, or a little less of it. The mushrooms and onions were outstanding – very intense with a rich, (slightly) beefy taste. My only big mistake on this cook was putting the steaks back on top the mushrooms and onions – the residual heat pushed the meat past medium-rare to just shy of medium-well. Still, I am surprised and how tender and juicy the steaks were even when a little over-cooked. 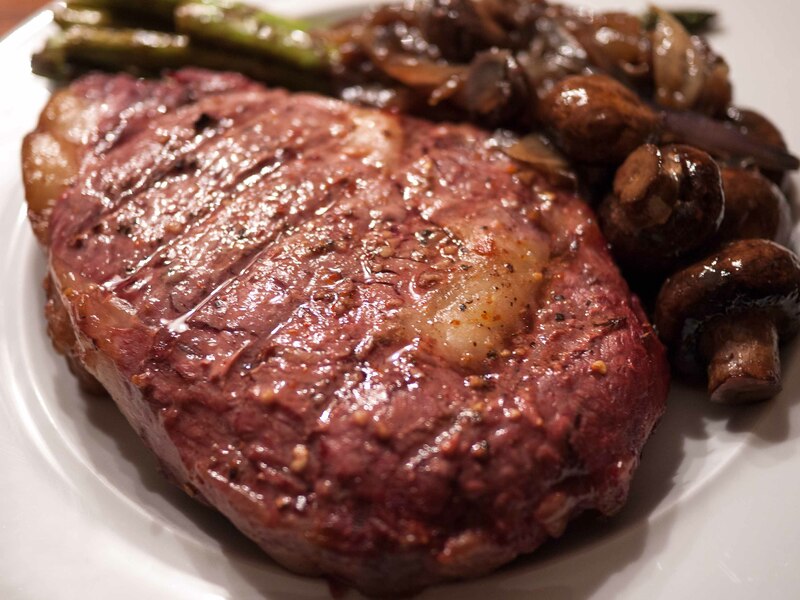 Ribeye is 2.1 points per ounce, so we made those monster steaks cover 4 meals. A serving of the asparagus and the mushroom and onions are probably a point a piece just from the oil and those lovely beef drippings. Watch the size of your glugs to keep them healthy. 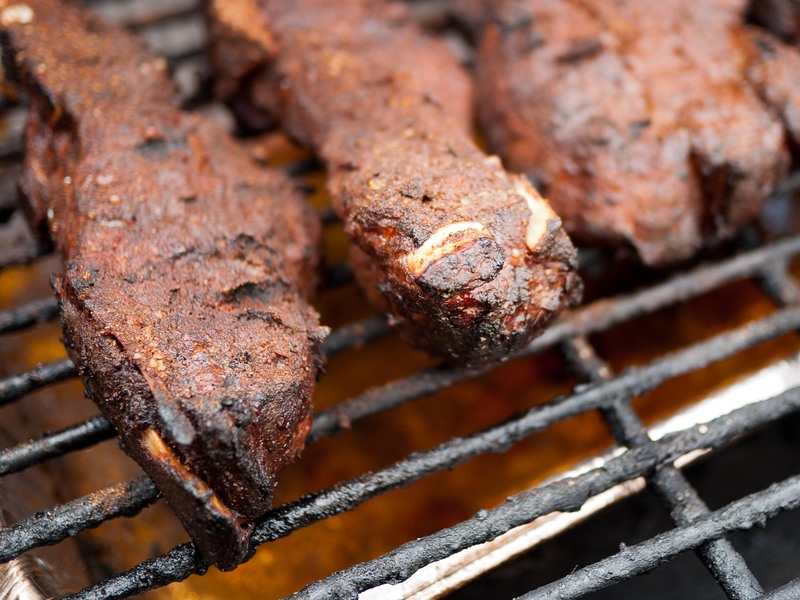 What makes for a good, all-around barbecue seasoning? 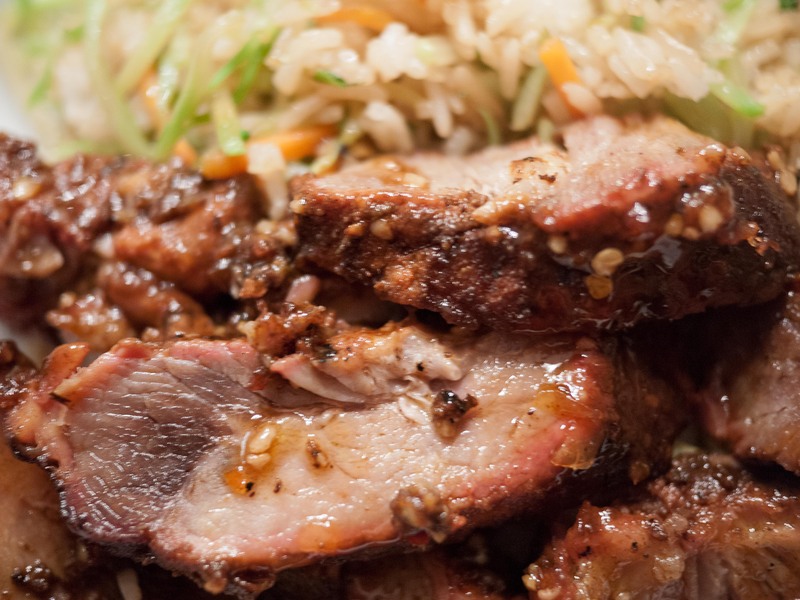 For me, it’s a mix of herbs and spices that gives you a layered, well rounded flavor with enough heat to make it interesting, and enough tangy sweetness to balance the rich flavor of the meat without overwhelming it. I’ve had a lot of fun creating my own barbecue sauces. After playing with sweet chili sauce in my Thai Sweet Chili Spareribs recipe, I wanted to try a recipe that uses traditional barbecue spices but uses sweet chili sauce for the tang and sweetness. Combine the rub with a 1/4 cup of the chili sauce. Put the ribs in a zip-top bag. Pour the sauce over the ribs, turning to coat. Squeeze the air out of the bag, seal it, and stash in the fridge overnight. Set your grill up for an indirect cook at 300°F. I used the inverted plate setter on the Big Green Egg and a drip pan filled with water to diffuse the heat. Add your smoking wood (apple, in this case) and when the grill reaches temp and the smoke has turned blue, arrange the ribs over the drip pan. 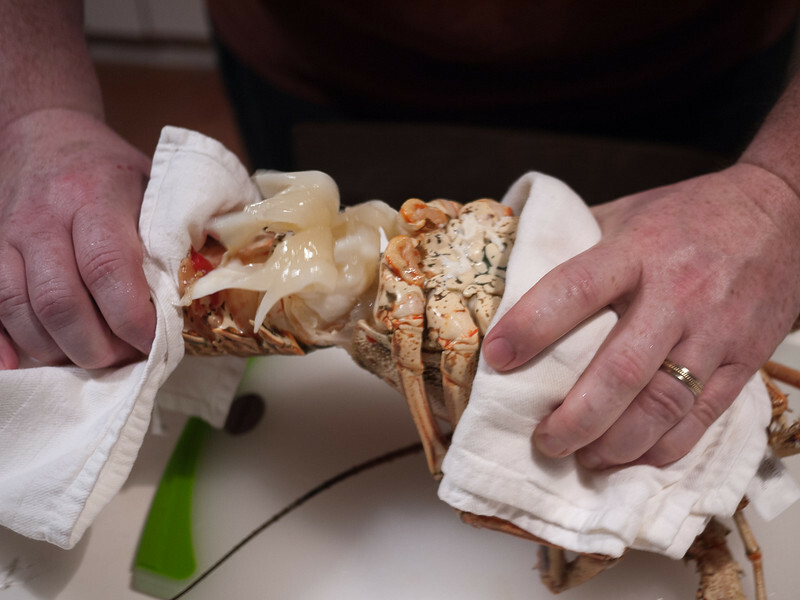 Close the lid and let them cook, flipping every hour, until they reach 160°F internal (about 3 hours). Lay down a sheet of heavy-duty aluminum foil and move the ribs to the center of the sheet. Pour 1/4 cup of the chili sauce over the ribs. Fold the foil over the ribs and crimp tightly. Move the foiled ribs back to the grill and cook for another hour. After an hour, carefully pull back the foil and check to see if the ribs are done. Their internal temp should be around 190°F and the meat should fall apart when you poke at it with a fork. If they are done, remove the foiled pack of ribs from the grill and let them rest for 15 minutes before slicing. If they’re not done, reseal and return them to the grill until they are. I thinly sliced the rib meat and served it over rice with the remainder of the chili sauce on the side. 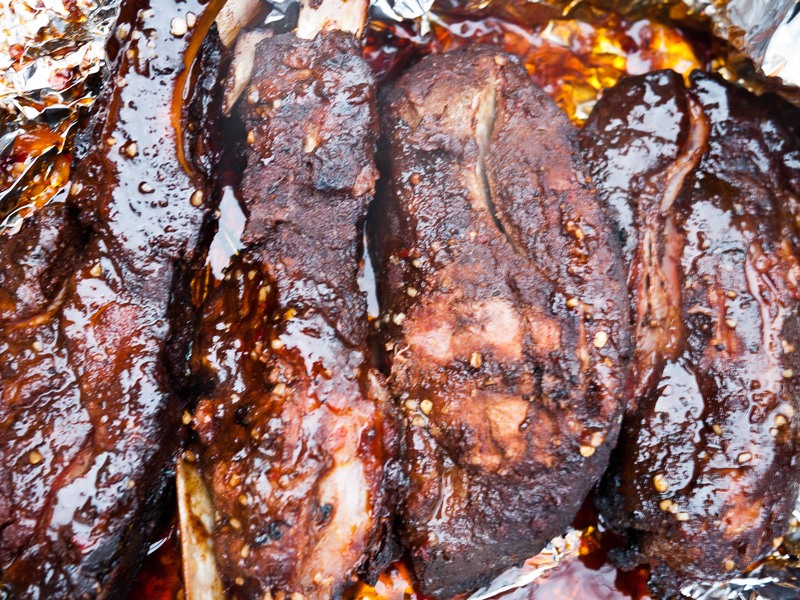 The combination of barbecue spices and sweet chili sauce is a real winner. The chili sauce just melts into the ribs and pulls all those lovely herbs and spices with it. As far as cuisine, it could really go either way – served over rice it was a great Asain-ish dish, but it would have gone just as well with baked beans and coleslaw. The next step is to build a barbecue sauce using sweet chili sauce as the base. Sadly, the pack of “boneless” country ribs I picked up looked a whole lot better in the store than they did on the grill. They were certainly not boneless, and had a bunch of nasty cartilage. What meat there was was very tender and tasted great, there just wasn’t a whole lot of it. Three ounces of meat is 387 calories and 10 Weight Watchers points, so this is best in a meat-in-a-minor key recipe. A few flavorful slices over a veggie-laden rice pilaf makes a great meal. One of the great joys in traveling is getting the chance to try out new foods. In Vieques, we rented a place with a kitchen so that we could hit the markets and do some of our own cooking with local ingredients. Puerto Rico has a pretty unique cuisine. The Taíno Indians, Spanish, Africans, and Americans all brought foods to the modern Puerto Rican table. So you get yuca and plantains happily coexisting with pineapples and chicharones. I got excited when we drove by an outdoor fruit market and they had a big sign out front advertising longaniza sausage. We wandered the market for a good 15 minutes, picking out some fresh pineapples and papayas, but couldn’t find the sausages. I finally asked somebody and they pointed to what looked like a trailer truck full of tires. I walked over and, sure enough, there were two freezers full of sausage tucked behind the Uniroyals. I got a couple of pounds of links, and when we checked out the cashier assured me that they made it themselves and that it was very good. That night I slapped them on the grill along with some pineapple. The minute they hit the grate you could smell the garlic :). I cooked them over medium heat for about 15 minutes, until they were well browned, but still juicy. 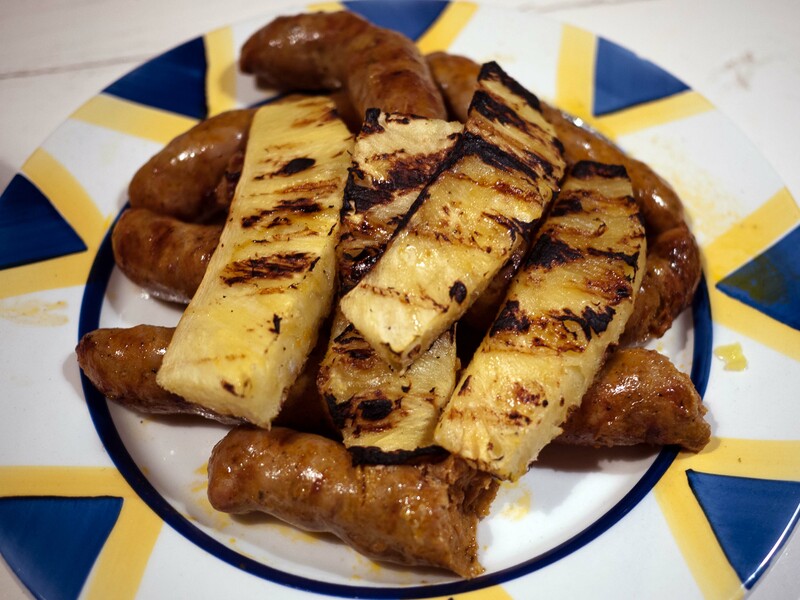 I served them with some tostones and the grilled pineapple spears. I’d never had longaniza before so I really didn’t know what to expect. 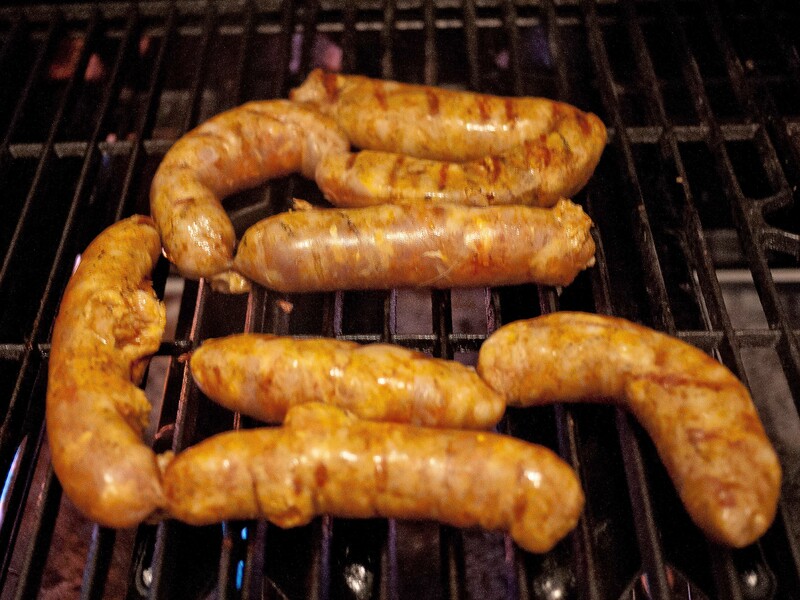 They tasted like a cross between a garlicky brat and Spanish chorizo. Not too spicy, but with a little kick of paprika and the earthy flavors of achiote. They had a coarse grind that looked to be a combination of ground pork and some larger chunks of cured ham. They were wonderful for dinner and then later chopped up into some eggs for breakfast. Again, what happens on vacation stays on vacation. I’m back! Had a lovely time in Vieques, Puerto Rico. The island was beautiful, the people were friendly, and the food was outstanding. One of the highlights of our trip was being able to buy fresh local foods from the small markets around the island. The pescaderia (fish market) was just down the street from the house we rented. When we wandered in there one day and discovered that they had a whole ice chest full of just-caught-this-morning lobster, we knew exactly what/who we were having for dinner that night. 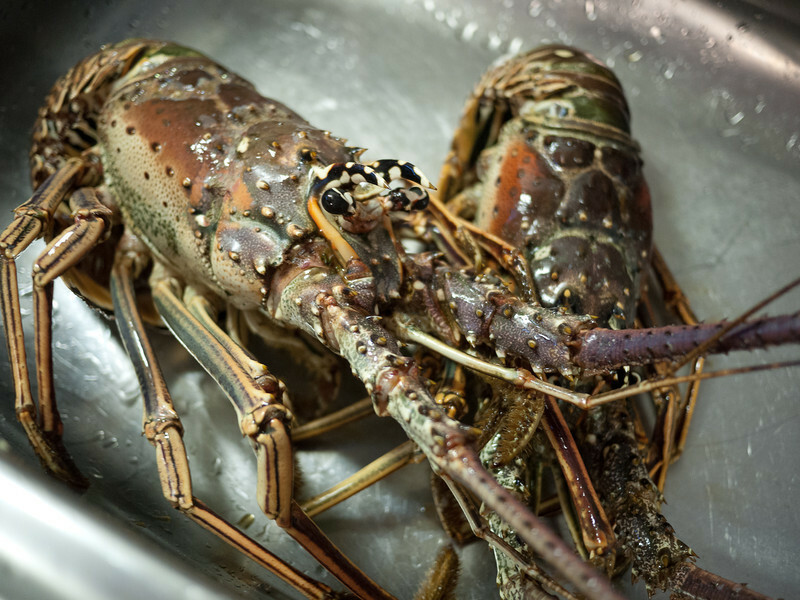 We picked out one 3-pound and one 2-pound spiny lobster. 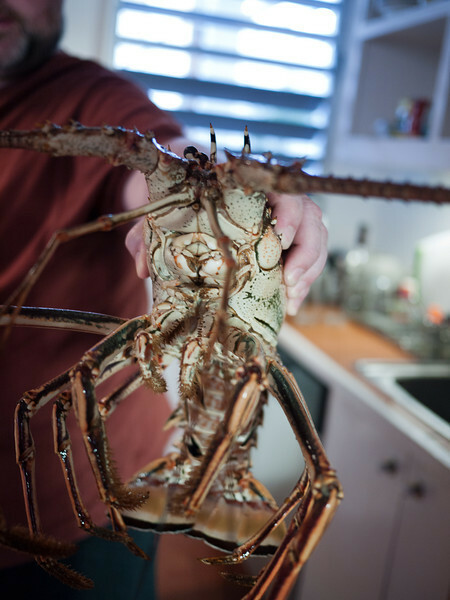 Caribbean spiny lobsters don’t have claws, so all the meat is in the tail and body. 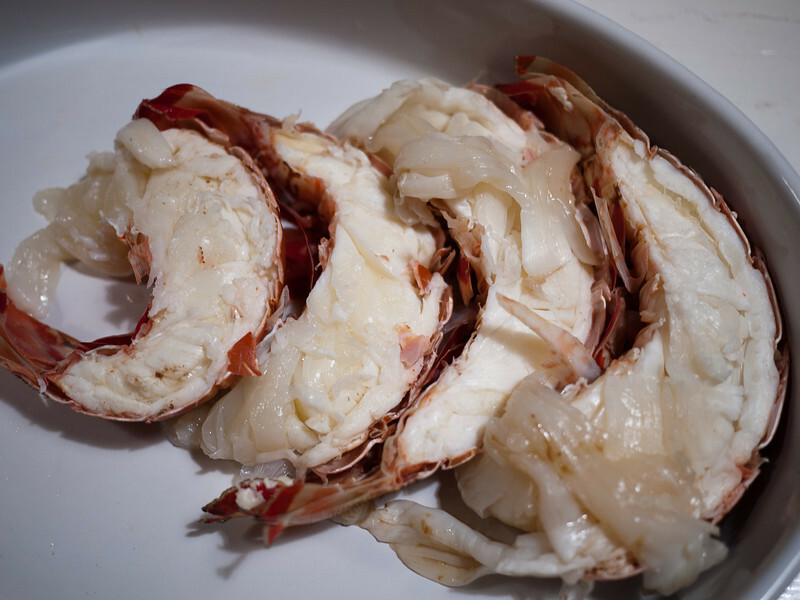 They aren’t as tender as cold-water lobsters, but have sweet and rich flavor that I prefer. The fish monger recommended just splitting the live lobsters down the middle and grilling them. But these guys were very active and not at all happy about the prospect of being the guest of honor at dinner. I tried to put the big one on the cutting board and got the distinct feeling that he was sure he could take this gringo in a knife fight. 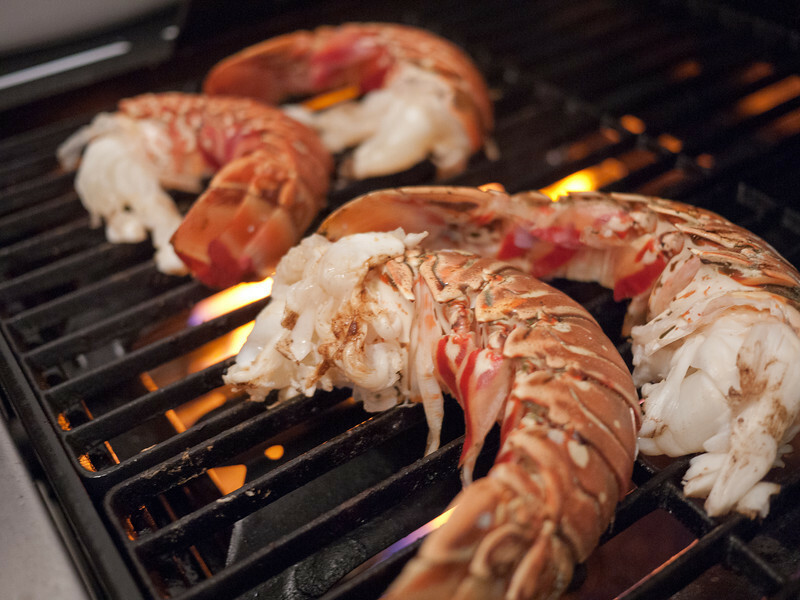 Time for Plan B – par-boil them first, then remove the tail and split and grill that. No muss, no fuss, and no late night trip to the emergency room with a lobster spine sticking out of my hand. I brought some salted water to boil in the largest pot I could find. One at a time, I dropped them in the pot, covered the pot, and boiled them for 10 minutes. I then moved them to the sink and sprayed them with cold water to stop the cooking and cool them down enough to handle. 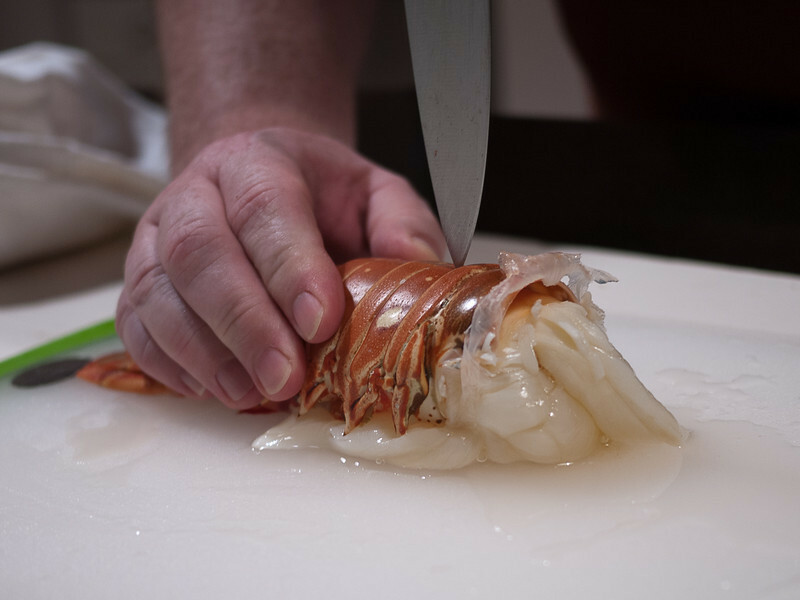 Now safely dead, I flipped the lobsters over, grabbed the tail in one hand and the body in the other and carefully twisted off the tail. Using the sharpest knife I could find, I split each tail down the middle. I found it easiest to cut through just the back first, and then come back around to cut all the way through the tail. Once the tails were split, I removed the dark vein that runs along the back. I melted about a half stick of butter and gave them a light basting. Now off to the grill. No Big Green Egg here, but they did have a very serviceable gas grill. I let the grill preheat with the burners on high for about five minutes. I turned the heat down to medium and put the trails on meat side down for about 5 minutes just to get some nice grill marks. I flipped the tails over, basted them again with butter, and let them cook another 5 minutes, just until the meat was opaque. I basted them one more time and took them off the grill. 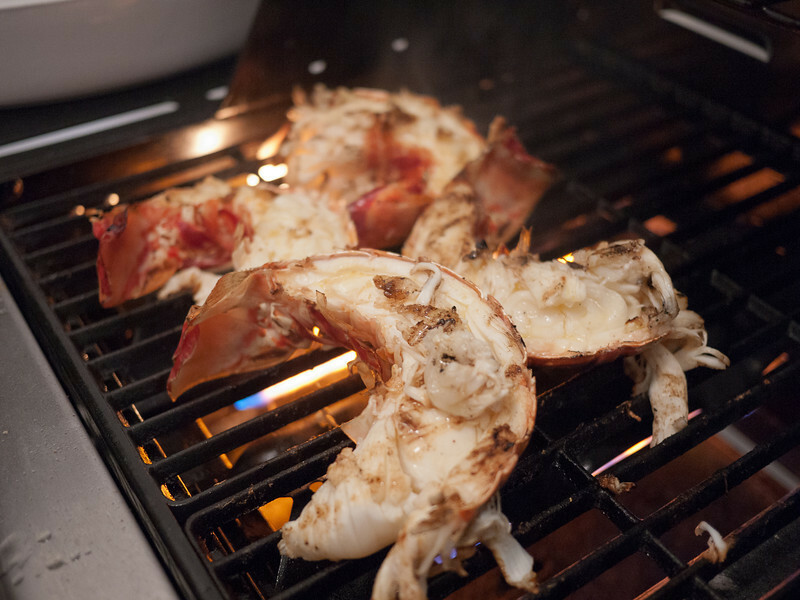 Sweet, tasty lobster with just a kiss of char from the grill – it doesn’t get much better. The meat was a little tougher than I would have liked, but the flavor rocked. 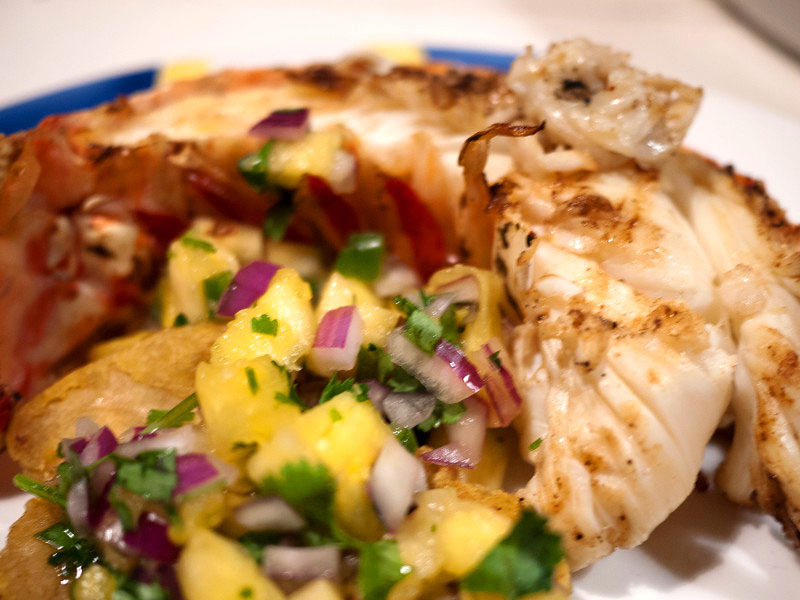 We served them with tostones and some freshly-made pineapple salsa. It’s vacation. There are no calories on vacation.